I made some pretty landscape of mountains and flowers, digital artwork last night that struck me as something to be proud of not just for its typical beauty. This artwork is composed of overlays I used in other art works, parts of the digital overlays that I love most. You may recognize some of the features, the red flowers, pink mountains or the lovely statue. I made a new happy place, where I can go in my mind, lay on the grass, wade in the water and sing to the clouds. I’ll share! Enjoy the artwork, read the art blog and please, comment at will. 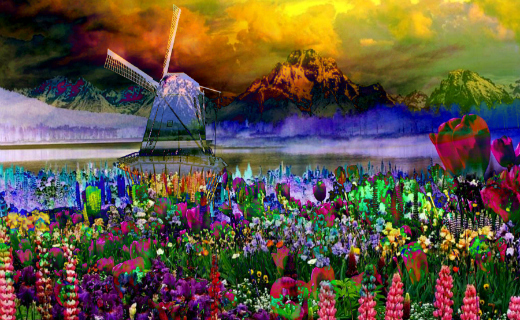 To see more landscapes of mountains and flowers, visit Impressionism Art Gallery. This is just beautiful… going topost it with scripture on my Facebook page!